Convert DVD/video movie to any video formats and extract audio files. Innovative software package downloads from the featured in download internets sites! Surf the popular software utilities groups, learn the latest refreshes of the perfect computers programmes, and obtain immediately! Do not lose an advantage to test the best package: use SoftEmpire website to setup software solutions for free. See the aggregation of free programs and software system demo versions. Choose among OS apps, download planners, softwares for relax, and all other types of software for your laptop or digital gadgets! 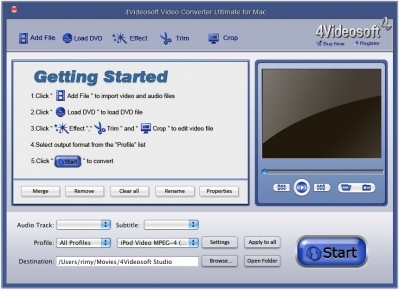 4Videosoft Video Converter Ultimate for Mac is a versatile Video Covnerter tool for Mac users, which can help you convert DVD disc on Mac and video files on Mac.Besides, you can convert DVD and video files to any mainstream video formats with it.